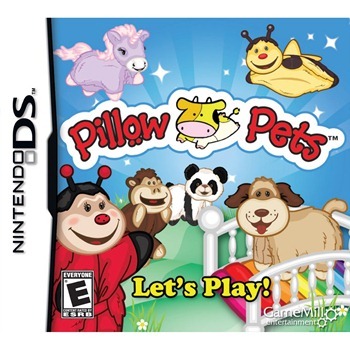 Based on the beloved children’s line of plush pillows from CJ Products that easily transform into snuggly companions, the Pillow Pets game for Nintendo DS invites you to jump, fly, buzz and explore Dreamland, the imaginative world where the Pillow Pets characters thrive. Get to know your charming pet’s personality as you customize him or her with hats, glasses, shoes and more! When your favorite pal goes missing you must set out on a journey to bring your lost pet home safely. But don’t fret! 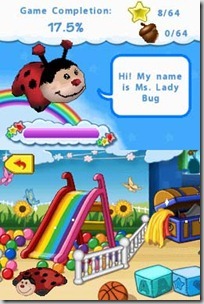 Along the way you’ll meet cuddly friends and uncover tokens and rewards that will make for an unforgettable experience! 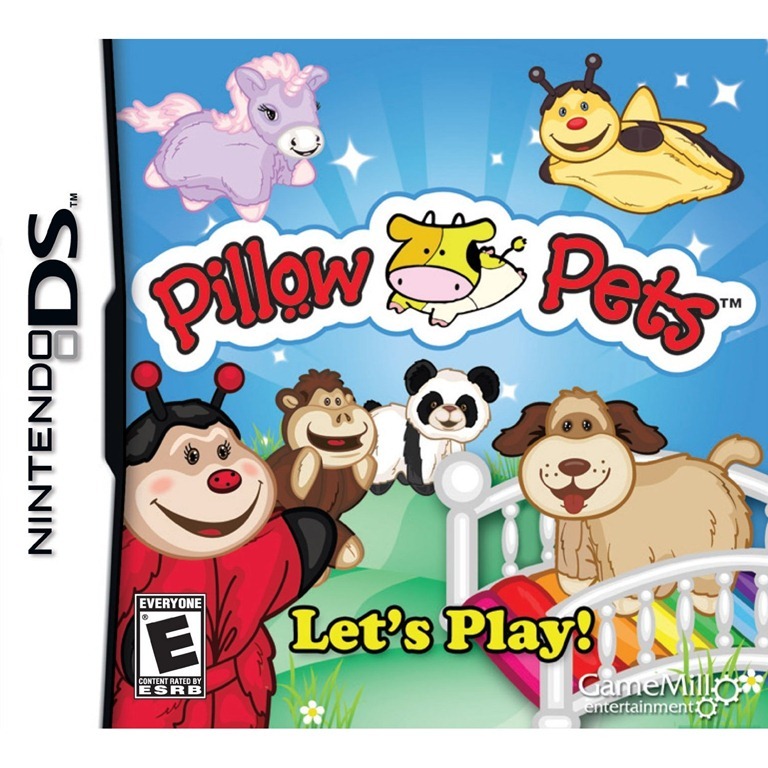 Whether playing alone or side by side with friends, the Pillow Pets game for Nintendo DS creates a nurturing and fantasy-filled adventure that can be enjoyed by boys and girls of all ages! • Collectables: Meet and collect up to 16 well-known Pillow Pets characters including farm critters, sea creatures and jungle animals! • Beautiful Lands to Explore: Venture into magical lands including Fantasy Woods, Rainbow Valley and Slumber Land Castle! • Customization: Accessorize your Pillow Pets from head to toe! Up to 40 accessories to unlock from hats and glasses to shoes and more! • Rewards: Gather tokens, unlock bonuses and garner prizes in each level! Since 2003, Pillow Pets™ brand products have been bringing smiles to the faces of all ages. The concept for the snuggly companions was the brainchild of a San Diego-based mother of two, who had grown tired of picking up stuffed animals strewn across her children’s rooms. What began with the simple goal of transforming a stuffed animal into a functional item for children has grown into an amazing jungle of popular retail and wholesale products including plush foldable stuffed animals, books, blankets, slippers and games. Pillow Pets™ plush animals are manufactured and distributed by CJ Products, LLC. For more information, please visit www.MyPillowPets.com. We have loved Pillow Pets in our house for quite some time now. We were first introduced to them when I did this review for the Snuggly Puppy. Our house has collected a few more of the months, including when we reviewed the Valentines Day plush cat and the Purple Fluffy Bunny. They are beyond adorable, soooo soft and when you aren’t using them for a pillow they make a cute pet to set on your child’s bed (or my kids play with them, too). Now Pillow Pets has expanded their reach and they have been animated in a video game for Nintendo DS. I am not surprised Nintendo took on this mission, as I have trusted them for years to provide more age appropriate games for my younger set. The DS is the perfect platform for keeping them occupied in the car, doctor’s office or while having quiet time in their room. Game play is pretty self explanatory and if your little girl is into accessorizing she will want to collect as many tokens as possible! Trade those in for your choice of over 40 accessories! 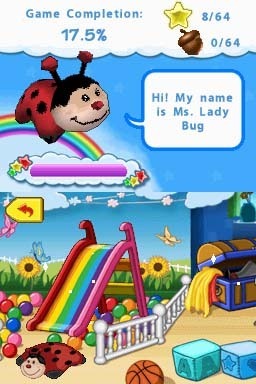 There are several “lands” to visit: Fantasy Woods, Rainbow Valley, and Slumber Land Castle while traveling through Dreamland. In my opinion, this game is perfect for the new DS gamer, maybe ages 4-8ish. There aren’t a lot of complicated moves and the storyline is sweet and fun. ONE OurKidsMom reader is going to win a copy of Pillow Pets for the DS and a Pillow Pet (actual pet received based on availability)! This giveaway ended at 11:59 PM EST on November 29, 2011. I went onto the nintendo website and learned more about the Super Mario Brothers Superland Game. It looks pretty cool, but my daughter would love the pillow pet game! Leaving a comment i would love to win the pillow pet DS game, my daughter is a big fan of elephant pillow pet. I would like Cars 2 for the Wii for my son. i want the new professor layton game! I’d love to have the New Super Mario Bros. game for the Nintendo DS. I would like Zumba Fitness 2 for the wii; to use as a gift for one of my friends! I love that you can “customize” your pillow pet, too cute!! I saw the nintendo 3ds and would love to get that! I learned that they have a Team Umi Zoomi Ds game out. Love when i can find games for my youngest!! I learned that you can customize the pillow pet with tons of accessories. Very cool. I would like Disney Universe for Wii. I love that the DSi has a camera! I think it’s awesome that Nintendo has come out with this game. I think it would be great for my 5yo as most the other games are too old for her. my daughter would love this game, and this website, they have great visuals! I want to get my DD the lalaloopsy nintendo DS game. I love all the games there. I love Puss N Boots and I learned that they have a Puss N Boots game!! i would love to buy my daughter the dreamworks puss in boots game for the nintendo DS!!! I want Fortune Street for the wii. my 11 year old daughter loves her penguin pillow pal she wont go anywhere without it!!!!!!! I want the Smurfs Dance Party for the Wii! 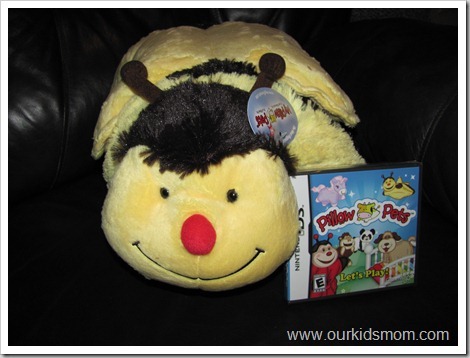 The Pillow Pets game for Nintendo DS creates a nurturing and fantasy-filled adventure that can be enjoyed by boys and girls of all ages! I am glad that nintendo came out with this game because my girls are such big fans of pillow pets. I would love to have the Just Dance 3 for my grandaughter, she loves to dance. We would love mario party 8. Thank you. There are a bunch of new 3DS games for my daughter. Yay! I learned there is a Puss in Boots game as well. Puss In Boots DS game. I would like to have the Bejeweled 3 Nintendo DS game on their website. I would love to get the Nintendo DS for my daughter! Thanks so much for the fantastic giveaway! 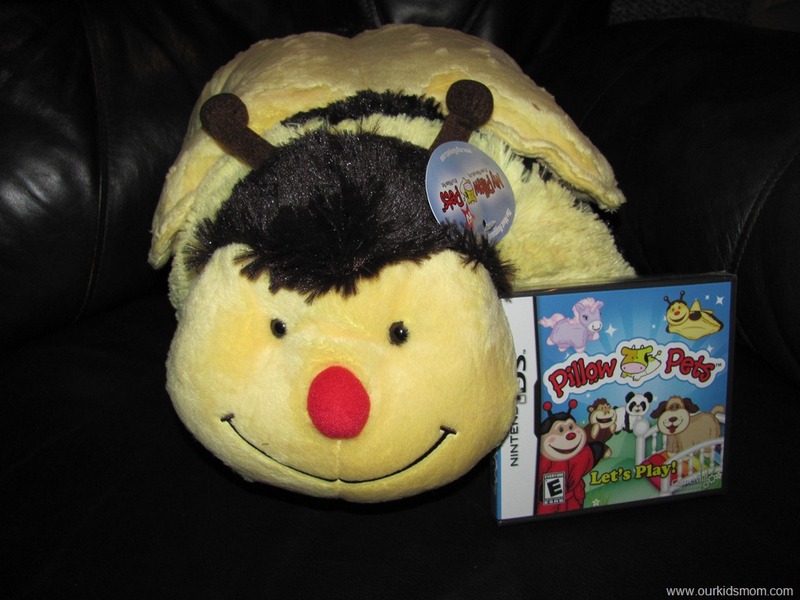 I would like to win this pillow pet and ds game. I went to the site and there were several games that i would like to have for the girls but I particularly liked the Dora & Kai-lan’s Pet Shelter. My kids love Pillow Pets! My son would love this game and my daughter always loves a new pillow pet. My son really wants the New Super Mario brothers game. I looked over this game on Nintendo’s site. After looking over this, this game looks PERFECT for my niece. I think that I just might go buy this for her for Christmas! I learned that they made a Puss and Boots game for DS now too! I want the Disney Universe Wii game. This is a one player game 🙂 Which will be perfect for my daughter! I would like Alvin and the Chipmunks: Chipwrecked. My kids love just dance. I am glad they now have one for kids! Alvin and the Chipmunks Chipwrecked game for the DS looks like fun! I learned Customization: Accessorize your Pillow Pets from head to toe! Up to 40 accessories to unlock from hats and glasses to shoes and more! I would like the zumba fitness 2 game for the wii!This would be great after I have this baby! My daughter really wants a Nintendo 3DS system. I like that you can search games by age which is great when searching for apprpriate games for my kids! I like the Monster high DS game for my daughter. we would love to have a wii! I like that you can get NES games and other console games on the WII. I like all the screen shots they have available of the games so you can have a good idea what the game will be like before you get it. I like the Fortune Street Wii game. Thanks for the giveaway! I like the black Wii. I’ve heard that scribblenaughts is fun. My kids would like to try that game. I like that they have a wishlist! Thanks for the chance to win! They offer a great variety of games for various players. I like Just Dance 3 for Wii. Oh the new Mario game Fortune Street looks very cool! My kids are begging for the Pokémon Rumble for the 3DS! We would love the Lalaloopsy DS game ! I like the Aliens – Infestation Game! My granddaughter would love the Puss n Boots for Nintendo DS also! 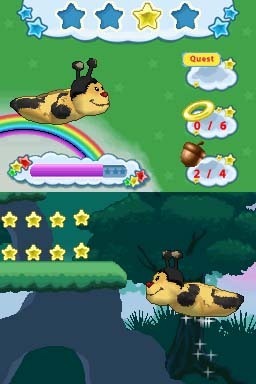 I learned one feature of the game is you can-Customization: Accessorize your Pillow Pets from head to toe! Up to 40 accessories to unlock from hats and glasses to shoes and more! My niece would love the SpongeBob’s Surf & Skate Roadtrip. We are fairly new to Video Games, so I really like that they are rated. I think it is nice that Nintendo has a link to the Entertainment Software Ratings Board, right beside the game’s rating. It helps me learn what I need to know! I want the pillow pets game and especially the duck pillow pet! 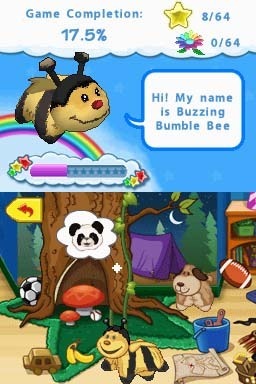 My kids would love it that you can customize the pillow pets outfits on the game! I’d LOVEEE to have the New Super Mario brothers game!! My son would love for me to win this giveaway! One of my kids got a DS for his birthday, now the other 2 want one! 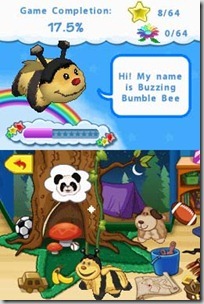 I want to get the ZhuZhu Babies game! I love Donkey Kong Country! My family loves pillow pets..i learned that there are many different styles. I just learned about this game! wow! Fortune Street for the Wii. I would love the buy the Zelda Sword game as a gift for christmas. The Adventure of Tin Tin game looks fun. My kids would luv the LEGO Harry Potter: Years 5-7 game. I’d like to have the DS3. The games seem to be very engaging and something the entire family could enjoy. I like the Classic Game section – still cool. I’ve always been a big fan of Nintendo, I like how you can go on the website and create an account that will keep you up to date with the latest Nintendo news. My son would love Puss & Boots. My daughter would also love the Happy Feet Two DS Game. THey have a large array of game that are conducive to 5 year olds. My daughter wants a DSi or 3DS instead of her DS Lite now. Mario Kart 7 looks fun too! I learned that there is a Lego Harry Potter for kids 5-7….cool! I learned that they have a new zelda game! I also like the Drawsome Tablet at Nintendo. Oh I so want Mario Sports Max! Fun! I want the new Super Mario Bros.
pillow pet DS game looks like alot of fun !!!!!!!!!!!!!!!!!!!!!!!!!! They pretty much have a game for any age. I’d love to get the new Professor Layton game. Those games are a blast! My daughters would also love Happy Feet Two: The Videogame. Thanks for the awesome giveaway! I would love the 3dDS! My daughter would love the Squinkies 2 Adventure Mall Suprize game. Thank you!! On the game you can meet and collect up to 16 well-known Pillow Pets characters including farm critters, sea creatures and jungle animals! I would also like the puss in boots game. I would love Lego Harry Potter for the Wii 5-7. I got my son 1-4 for Christmas. I want the Zumba game for the Wii! I’d like a Nintendo 3DS! I would love the Victorious game! They have some fun childrens games on their site with the pillow pets. Thanks for having the contest! I like the dreamworks super star kartz! I’d love to have a Wii! I’d like to get Disney Universe for the Wii! I want the Lalaloopsy game for my girls.